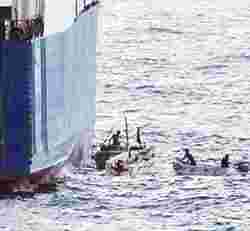 High-sea action: A 25 September handout photo provided by the US Navy shows Somalian pirates in small boats hijacking the MV Faina, a Belize-flagged cargo ship owned and operated by a Ukrainian firm. Mumbai: Indian seafarers are refusing to operate ships that pass through Somalian waters in the north-west Indian Ocean out of fear of pirates. Cargo coming from Europe and going to Europe from India has to pass through this route. Ships otherwise have to take a much longer route around the Cape of Good Hope, adding to freight costs. Some 50-60 vessels ply on this route daily. On 16 September, industry regulator Directorate General of Shipping said that a vessel—the Hong Kong-registered MT Stolt Valor—was reportedly hijacked from the Gulf of Aden with 22 crew members on board, out of which 18 were Indians. The vessel’s last port of call was Suez and next port Mumbai. From information received by its managers from the ship’s captain, all crew members are safe and the vessel is being taken to Somalia. Last week, a Ukrainian ship, the MV Faina, was seized by Somalia-based pirates. The pirates have demanded $20 million (Rs93.8 crore) for the release of the ship and its 20 man crew, which includes two Russians. The ship is loaded with more than 30 battle tanks and other armaments, and the pirates warn they will fight to the death if attacked. The US destroyer USS Howard and several other American ships have surrounded the Ukrainian cargo vessel MVFaina, which was hijacked on Thursday and is now anchored off the coast of Somalia. Russia has also despatched a warship to the area. Meanwhile, following the refusal of Indian crew to sail, Indian shipowners have demanded protection for Indian seafarers working on Indian and foreign ships. Indian seamen account for 6% of the global seafaring population. “Indian National Shipowners’ Association (Insa) has briefed us about the situation," A.P.V.N. Sarma, secretary at the ministry of shipping, road transport and highways told Mint on the sidelines of the India Shipping Summit. “The ministry of shipping alone cannot take a decision on this. We are talking to the defence ministry to find out a solution." According to a person familiar with the development, the ministries of shipping, defence and external affairs will meet soon. The external affairs ministry is not keen on sending a navy vessel or naval commandos to guard these ships, he added, asking that he not be named. “The government has to come forward to help the local shipping industry by sending navy ships to save the lives of Indian crew...," said H.K. Mittal, chairman, Mercator Lines Ltd.
“If our ship(s) don’t sail because of refusal of crew to operate the ship along the route, we end up losing thousands of dollars a day," he added, pointing to the fact that ships operated by British crew were recently given protection by the French navy. “Even though the wage agreement between shipowners and seafarers for paying Rs10,000 additional salary in such risky cases (has been reached), Indian seafarers are not willing to operate ships," Mittal said. Meanwhile, discussions have been held over phone between Insa officials, union members, Mercator Lines executives, and the captain of the vessel that is to sail to the UK, and the captain has said he can decide on restarting the journey only after consulting with the crew, according to a person who participated in the call but did not want to be named. The ship is currently anchored in mid-sea. “Though I have not gone into the details of the matter, I would only say that it is unfortunate that master and crew have decided to stop sailing," said Yudhishthir Khatau, managing director of Mumbai-based Varun Shipping Co. Ltd, the largest Indian liquid petroleum gas or LPG transporter. “There is no war or war-like situation in that area. Moreover, there (are) other vessels plying on that route. Therefore, crew cannot take a call like this."